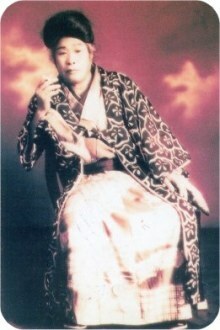 Of all the writings by Onisaburo Deguchi, the one of the utmost importance is the Reikai Monogatari (Tales of the Spirit World), or the Monogatari for short. It consists of a total of 81 volumes (83 books), which Onisaburo created using the method of dictation. In fact, he dictated to his scribes at the average speed of a whopping 3 days per 300-page volume! 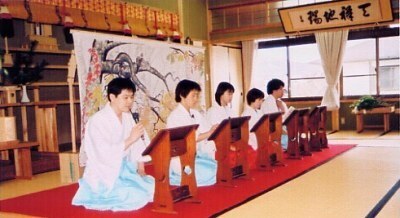 The Aizen-en regards the Reikai Monogatari as its sacred text. This scripture covers a broad range of topics including the deities of the world, the afterlife, the way of man, prophetic messages and essays on art. It also takes on the aspects of fairy tales as Onisaburo says he wrote it so that even three-year-olds could understand. With its many different themes randomly woven together, the Monogatari would make you wonder, "What on earth is this?" Even if you feel this way, we suggest that you spend some time reading aloud the first 30 volumes with emotion as if you were acting. The tales' mysterious charm will fascinate you. But the Monogatari is simply voluminous! You would need about eight months to read it through even at the pace of finishing one volume every three other days. Moreover, with the text this long, you may forget what you have read till then, or your enthusiasm may run out halfway. To keep the fun going, we hold the Reikai Monogatari reading sessions in various parts of the country. You are most welcome to join us. There is no need to have the scripture to participate. Just bring yourself, and we will take care of the rest. The interested reader may contact the Aizen-en for more information. Click here for the Reikai Monogatari PDF files. Copyright © The Aizen-en All Rights Reserved.